What a great weekend in Annapolis, the inaugural J/70 Corinthian Nationals proved to be a wild success with amazing conditions and almost 50 competitors. The Ullman Sails Newport Beach and Annapolis team had a phenomenal time getting to know the different teams and answering questions from that days racing and J/70 sailing. 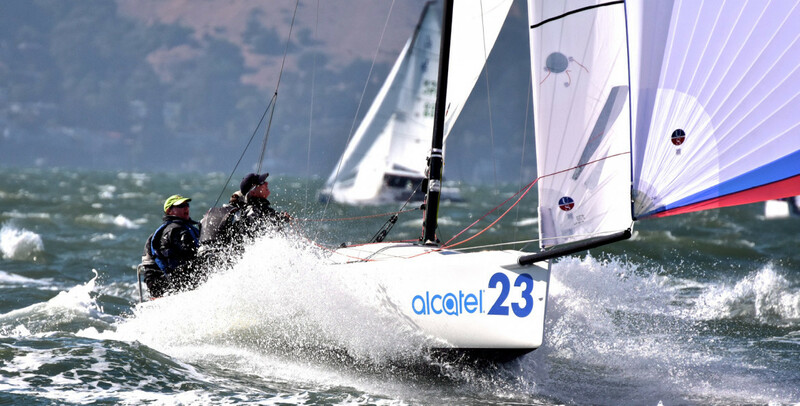 Corinthian sailing is something that hits home with the Ullman Sails NB loft boat recently claiming the top spot as 2016 Corinthian World Champions on USA 32 (see photo at bottom). The backstay is the single most important control on your J/70 upwind. The boat comes from the factory with a backstay set up that is acceptable, but not ideal. The most important part of the backstay is getting the gross tune correct. Many people have a spliced gross tune, but the problem with that is you can never get the gross tune tight enough for breezy conditions. The best thing to do is get a low friction ring and attach it to the port leg of the backstay. From there make your own purchase system. Always tie the half hitches near the ring end. This will make it easier to adjust. If you put the half hitches on the end with the shackle then it becomes much more difficult to adjust. Next, you will notice there are three blocks, two attach to each of the legs and then the third is what will be connected to the boat for adjusting by the main trimmer. The side by side blocks as set from the factory are too far apart. This makes it hard for the whole unit to move together for maximum power and efficiency when applying the fine tune adjustment. Try to tie the three blocks as close together as possible. Overall you will use less manual energy to get the blocks to move together at give you maximum effect. What side of the course has more breeze? What phase is the breeze in? What end of the line is favored? What is the current doing? All of this can be achieved with one maneuver before the start, and that is going head to wind in between the gates (see picture below). 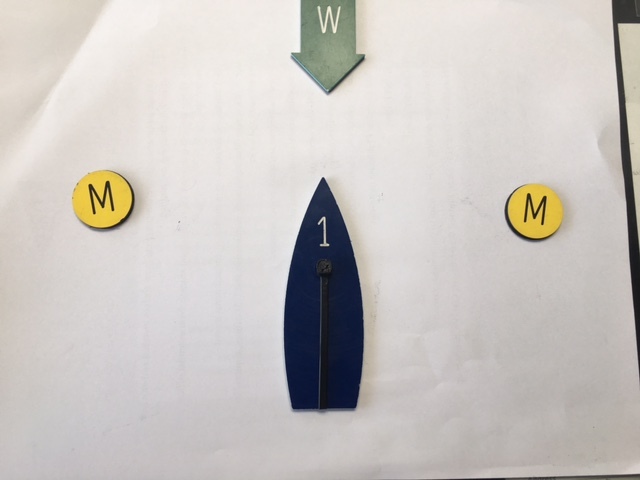 Based on boat positioning, boat movement, water moving past mark and bow angle in regards to the weather mark, you can answer all of these questions. If the bow is pointing head to wind and angled more toward one buoy more than the other, then your bow is pointing at the favored mark/gate buoy to round. By doing this same process three to four times before the start of every race it will give you and your team a better idea of the dominant strategy. Sticking to routine over the course of the event will lead to more consistent races, and better overall results. Both Corinthian and professional teams have goals. If a team has goals, they know what they need to work on for the future. There is no goal to small whether its trying to finish a race in the top 10 or get to the weather mark in the top 10, having goals will help to improve your sailing. After a regatta, like the J/70 Corinthian Nationals, it’s important for teams to sit down and think about what they did well, and what needs improving. This will allow teams to set practice goals and goals for the next regatta. The suggestion is always work on what needs improvement. There is no sense in working on something you are good at. *what you learn in a day is equal to 6 months of sailing by yourself! *get 2-3 boats together and split the cost, it will be 100% worth it! For more information about Ullman Sails J/70 sails contact One Design Coordinator Alex Curtiss at acurtiss@ullmansails.com.